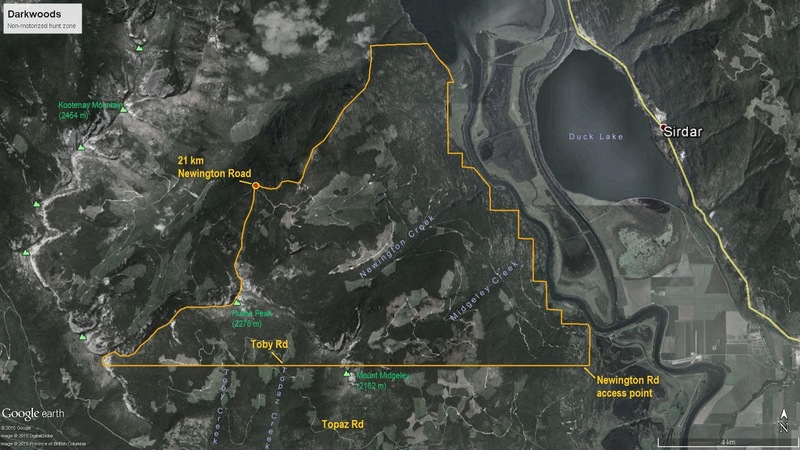 Nature Conservancy of Canada will be providing access opportunities for non-motorized hunting on the Darkwoods property for the fall seasons. Hunting access will be facilitated by the Creston Valley Rod and Gun Club, Non-motorized Hunting Committee. We are pleased to have this opportunity available to hunters and hope that the success of this project may lead to hunting opportunities in other areas of Darkwoods in the future. As such, our ethics and conduct are essential. *Camping is not permitted on the property. *Camp fires or cutting of firewood is not permitted on the property. Plan to bring a camp stove for cooking. *Access if via the Topaz and Newington Forestry roads. 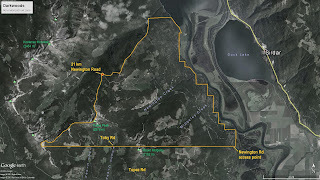 The Topaz Entry Point to the property is approximately 10.5 km through an existing hunting vehicle access closure (see map of hunting area below). You must have a non-motorized means to transport gear and game in and out 15 to 20km (each way) in any weather without spoilage or waste. *Every person must obtain a hunting permit from Darkwoods. They are free and can be requested by contacting the Creston Valley Rod & Gun Club, Non-motorized Hunting Committee by email at non-motorizedhunting@gmail.com or by contacting Corey Phelps at 250-428-4500. *In addition to the Darkwoods access permit, you must hold a valid BCWF Outdoor Passport to enter Darkwoods. This is required as Darkwoods is private property. The BCWF passport programme can be viewed at BCWF.bc.ca (click on programmes). This takes time, so plan ahead. *Darkwoods is grizzly country. You must be bear smart and be able to share the habitat peacefully. *All garbage must be packed out. Messy or unethical practices will not be tolerated. *The Nature Conservancy of Canada would like feedback following your hunt including information on any game taken, pictures (scenery, wildlife, etc. ), quality of experience and state left by previous users.